I wrote to Jim’ll Fix It as a child asking if I could be a football mascot. It was my dream. The chance to be so close to my heroes led me to take immense care with my letter. The process I followed was detailed. This was to be the best letter ever sent into the programme. Mark Twain, who famously said “I didn’t have time to write a short letter so I wrote a long one instead”, would have been impressed. After a number of iterations the letter was sent off to the BBC. I never heard back. As an eight year old the disappointment was huge. Recently a friend’s eight year old son fulfilled my dream of being a football mascot but for Everton rather than my team, Liverpool. In the few days before he walked out at Wembley I was excited for him. As kick-off approached and I watched the coverage on TV I thought just how lucky he was. Happily the experience was as I always imagined and he had an amazing time. A spectacular day to remember forever. While many children share dreams like mine of being a football mascot, not all children are well enough to fulfil them. This week’s award winner bridges this gap but also offers so much more. Everton fan Jack McLinden, who has multiple health conditions, experienced joining his heroes on the pitch before their game against Newcastle United with the aid of a robot. 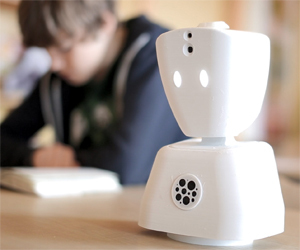 The robot, called AV1, was made by Norwegian firm No Isolation and was designed to help youngsters with long-term illness battle loneliness and attend school from home. The potential is enormous to give children battling chronic illness and their families a lift, a way beyond the four walls of their bedroom, and a way to connect with the world that can often seem so far out of reach. A special mention has to be made to WellChild who made the experience possible as well as Everton who embraced the idea brilliantly and implemented it with genuine enthusiasm. The robot was walked out onto the pitch by the Everton captain, Phil Jagielka, and fed back panoramic images to a tablet computer in Jack’s bedroom. A microphone enabled two-way communication. After the match AV1 also attended the manager's press conference. Beyond making Jack’s dream a reality the potential of AV1 for changing children’s lives is fantastic. After applauding a business last week for shunning the sometimes misguided use of technology and focus of other ways of connecting with their audiences, this week we have technology to open up new ways to communicate and connect with the world which is why No Isolation are my Communicator of the Week.